Flexible pads containing red and infrared LED lights are placed directly on the skin. They are turned on and left for a 20 minute cycle. Energy from the lights penetrate though the skin and is absorbed by deep tissue. This dramatically increases blood circulation, reduces inflammation and promotes healing. For example, after 30 minutes of treatment, blood flow is enhanced by 400% and this increased circulation continues for several hours after. The key to this increase in blood flow is the release of Nitric oxide from hemoglobin. This powerful signaling molecule helps regulate blood pressure, prevents arterial spasm, and discourages platelets from clumping together in the blood. It protects the artery walls and boosts circulation. The result is a rapid relief of discomfort, improvement in sensation, and regeneration of damaged tissues. Increase circulation and formation of new capillaries. Infrared therapy uses infrared and visible light emitting super luminous diodes (SLD) embedded in flexible neoprene pads which are placed over the treatment area. 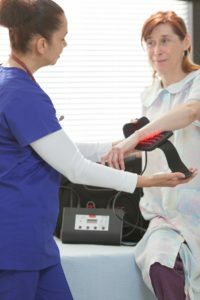 Infrared therapy may be used to temporarily increase local circulation, relieve stiffness, promote relaxation of muscle tissue and provide temporary relief of minor muscle and joint pain associated with a wide variety of conditions including arthritis, chronic pain, connective tissue dysfunction and neuropathy. Infrared therapy provides mild to moderate thermal effects and is well tolerated by patients. Electrical stimulation may be applied in conjunction with infrared therapy through a probe or using electrodes for pain management. 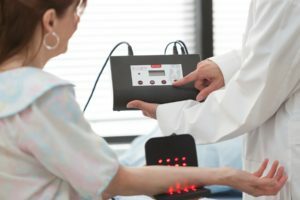 Electrical stimulation has been used safely for many decades to help manage pain, relieve muscle spasms, increase range-of-motion, prevention of disuse atrophy, increase circulation and re-educate muscles. Electrical stimulation is generally considered painless and is well tolerated by most patients. Light Therapy often leads to a reduction or discontinuation of drug therapy and the postponement or avoidance of surgery. Pads are embedded with Infrared SLD diodes at 875nm and 630nm wavelengths, emitting light energy in the visible and infrared spectrum for the delivery of light therapy and mild topical heating. Treatment can be delivered at multiple sites with and rapid set-up over key nerves, arteries and acu/trigger points, and can be strapped in place for hands-free treatment.